Celebrating its twenty sixth aniversary, the Aydin Dogan International Cartoon Competition, an international institution, renowned for emphasizing throughout its trajectory the importance of freedom of expression, awarded in 2009, 15 distinctions for works selected amongst 3127 drawings of 1116 artists from 85 countries, inviting the selected artists to Istanbul. Istanbul is the biggest city in Turkey. It was called Byzantium until 330, then Constantinople (¨City of Constantine¨, in Arabic), until 1930 when it was officially named Istanbul. Its name is originated from Greek Eis Tin Poli, since it was the Greeks, who called Constantinople ¨The City¨. Unesco declared World Heritage Site to Istanbul’s historical areas in 1985 and in 2010 it was expected to be declared the Cultural Capital of Europe. The outstanding organization of the graphic humor contest which has more history than all the others nowadays, is not however, its only activity. The foundation has dedicated, since 1996, to sponsor and promote the improvement of public health, education, scientific research, sports and economy. Named after its founder, Aydin Dogan, one of the most prosperous businessmen in Turkey, born in Kelkit in 1936. 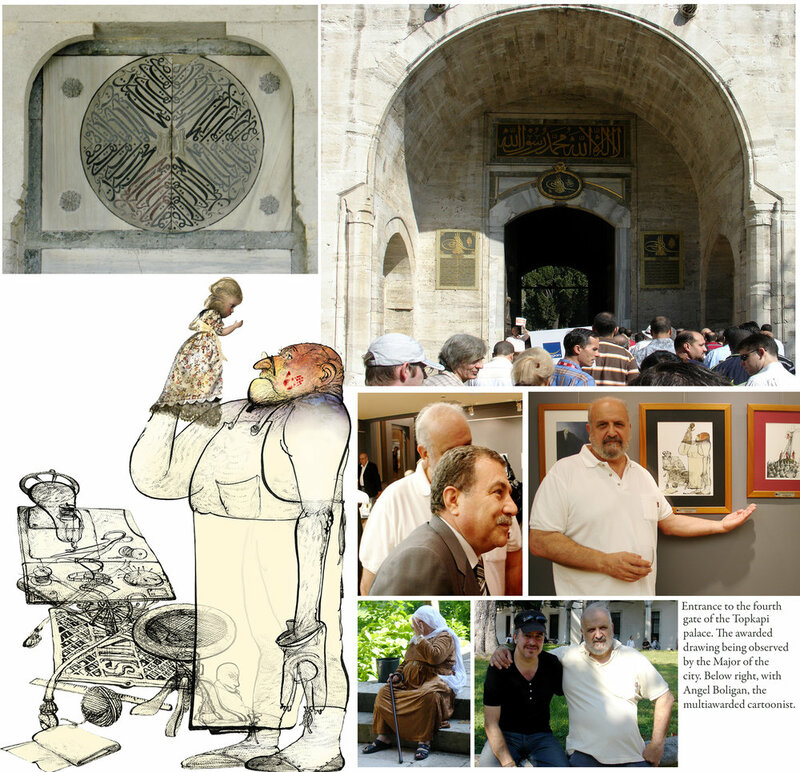 “The commitment of the Aydin Dogan Foundation to recognize, support and promote the graphic-political commentary and the cartoon is absolutely remarkable and has been a kind of epiphany come true for those of us who devote our lives to this job “Patrick Oliphant, winner of the Pulitzer Prize in Editorial Cartooning, in 1967”, and renowned graphic humorist, commented. We were greeted with a welcoming cocktail and then dinner at the magnificent Armada Hotel, where we stayed. As from the following day, we participated of a series of visits to the city’s different icons: The Topkapi Palace, the Blue Mosque, the exquisite Santa Sofía church, the Great Bazaar, The Spices Bazaar and Kadir Has University, where we held a meeting with the students of Art and we interacted with them, drawing in big panels after lunch. It was my first visit to Turkey and it could not be more shocking. Not in vain had it been the capital of the Ottoman Empire -دولتعالیهعثمانیه-, almost as vast as the Roman and it remained at the center of the interactions between the East and the West for six centuries. The first phase of the Ottoman expansion took place under the rule of Osman I (1288-1326) and continued in the reigns of Orkhan, Murad I and Beyazid I, at the expense of the territories of the Byzantine Empire, Bulgaria and Serbia. Bursa fell under his rule in 1326 and Adrianople in 1361.